For the region, see Arabia (region). Arabia is a formable country located on the Arabian peninsula in the Middle East. It can be formed by any state in the Levantine culture group except those with Turkish culture. Forming it will raise the government rank to empire, creating a cultural union of the Levantine group. 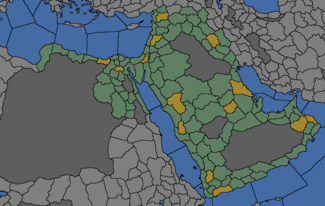 Provinces in orange must be owned and cored to form Arabia. Forming Arabia grants permanent claims on the shaded area. Arabia can be formed from numerous nations in and around the Arabian Peninsula, including the Mamluks. 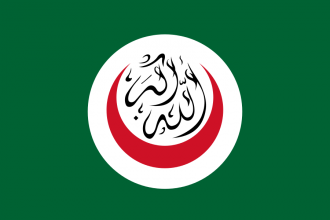 The Mamluks are perhaps the easiest country to form Arabia with, as they have many of the required provinces and Hejaz as a vassal, also getting an event to annex Medina once it has been vassalised, adding more of the required land to the Mamluks after diplomatic annexation. Since the Mamlukian government (Sultanate) gets increased vassal income and the Arabian minors are generally easy to force into vassalization, it is recommended to do just that. Don't waste admin points in Arabian peninsula. Instead, vassalize the Arabian minors peacefully or forcefully and diploannex them as soon as possible. The player's next step will be taking Baghdad from Qara Qoyunlu since it is necessary to form Arabia. It is also recommended to take the other culturally Mashriqi lands since the player will have a permanent claim on them as Arabia and will want to take it before the Ottomans do. The last part, but not the least, is the Ottomans. With this foe the player will need luck and diplomacy. It is advisable to ally Tunis and a powerful European nation that has rivaled the Ottomans in the early game, like Poland or Austria, and fortify the border with the Ottomans to prevent any unwanted Ottoman aggression. This is probably the hardest possible start, as it isn't enough to defend Granada against various ambitious crusaders (among them Castile/ Spain of course), the player also needs to gain the faraway Arabian lands in the east to even try claiming the title of Caliph. Having Andalusian primary culture means Granada would need to shift culture once they have worked through North Africa and gained the required territories. This is necessary as Bedouin should become majority culture once all of Arabia is conquered. If this isn't the case then Granada expanded the Andalusian culture too much, or using Common Sense expansion developed the Iberian territories too well. This can be fixed by either also developing the Arabian desert provinces, creating vassals and giving them Granada's Iberian lands until it is possible to change primary culture and reannexing them, and unstating Iberian provinces. For players aiming to get the Sworn Fealty achievement, Najd is the stronger contender of the weak landlocked tribal federations. Early game is a land race with the Mamluks who will passively absorb the Hejazi minors within the first 100 years. However the player can generally ally the Mamluks at the start to ward away hungry neighbors. Priority nations to conquer would be Shammar to the north and Dawasir and Mikhlaf to the south to contain Mamlukean expansion on the peninsula. From there follow the winds of fortune to pick off weak neighbors to consolidate the peninsula under your banner. The player should aim to border the Syrian provinces of the Mamluks before breaking the alliance to trade up to the Ottomans. Blitz Aleppo in the first war and strive to be the war leader at all times in the Mamluk/Ottoman wars to control the peace deal. Depending on how Arabia was formed will dictate what problems it will face. If formed by an Arabian state, the next biggest problem after The Mamluks will be Qara Qoyunlu. One solution is to use the Ottomans to crush them. The next step is largely up to the player. Arabia can either expand east towards the Timurids and the Indian empires, west towards the North African trade nations, or south towards the Coptic African powers. In the late game, if the Ottomans have become weak, it is also recommended picking them off. This page was last edited on 4 January 2019, at 10:10.